On October 14th, 1888, Augustin Louis Le Prince shot the world’s oldest surviving piece of film – in a Leeds suburban garden. Widely known as the “Roundhay Garden Scene”, the footage was shot by Louis Le Prince at the now demolished Roundhay Cottage, later known as Oakwood Grange, Roundhay in Leeds, and featured Le Prince’s son, Adolphe; a family friend, Annie Hartley; and Le Prince’s parents-in-law, Sarah Whitley (1816 – 1888) and Joseph Whitley (1817 – 1891). Le Prince had succeeded in developing a single lens camera and also figured out how to project images. There is every reason to believe he was the first person in the world to do this successfully. This caught my eye for several reasons. Not least, because like many of Leeds’ burgeoning middle classes in the nineteenth century; my family made the move from industrial Holbeck out to Roundhay. Later, my father was born close by Roundhay Park and one of my great grandfathers farmed on Lord Harewood’s estate at Roundhay. So when I see “Roundhay”, I always take an interest. The compelling and weirdly haunting footage lasts only 2 1/2 seconds, showing the well-dressed, middle class family dancing on the lawn. Adolphe Le Prince, trying to establish a US patent for his father’s invention, was able to prove the film’s date as his grandmother, Sarah (the lady walking backwards), died ten days after the film was made. Imagine being the first person in the world to see moving images of your dead loved one, which the Whitleys and Le Princes almost certainly were. I wondered who Sarah Whitley was, and where she lived before she came to Roundhay. The answer, as I was to find out, was fascinating. To me, anyway. 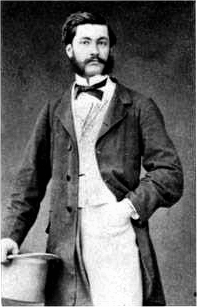 By the time Adolphe Le Prince was doing this, his father was missing, presumed dead – vanishing somewhere between Dijon and Leeds, in September, 1890, only two years after the Roundhay Garden scene was shot. Louis was waved off on the Dijon-Paris train, by his brother and no-one was to see him alive, again. He’d been on his way back to Leeds where his invention and contents of his studio were packed up, ready to be dispatched to New York where the rest of the family waited and he had planned the world’s first public demonstration of his invention; moving pictures. Louis, and the luggage he had with him, which may have contained crucial information about his latest camera, vanished seemingly into thin air. In recent years, a photo of a drowned man from Paris has come to light that some people believe could be Louis. We will never know. At the time of his disappearance, he was about to get a UK patent for his latest projector. As a strange codicil to the story, a few years after giving evidence about his father’s invention, Adolphe Le Prince was found dead in an alleged “shooting accident” in upstate New York. There were no witnesses – his body was found in woodland. Even before I know the fate of two of the first ever film’s ‘stars’, and its cinematographer and inventor, I found the fleeting 2 seconds’ of footage somehow haunting and moving, without really knowing why. Part of me looks at this like any costume historian. (The Whitleys could come from the 1850s, rather than the 1880s! The two younger folk look, as you’d expect, much more fashionable for 1888). Part of me looks at this like …. well, you’ll see. Louis was born in Metz, France, in 1841. His father was a friend of Daguerre, one of the founding fathers of still photography. Whilst studying in Leipzig, Louis met John Whitley who invited him to come to Leeds to work for his father, Joseph Whitley, brass founder. Louis duly moved to Leeds in 1866 and three years later, married Joseph’s daughter, Sarah Elizabeth Whitley (“Lizzie”). As we have seen elsewhere on the blog, Victorian Yorkshire industrialists were often very well travelled, and those working in technical fields, frequently went to Germany for the sort of advanced scientific and technical education British universities remained too hidebound to provide. In 1930, a memorial plaque was placed on Woodhouse Lane – Louis had worked there in Joseph Whitley’s workshop. One of Joseph’s employees, James William Longley, was especially closely involved in the camera and projector’s development and the week the plaque was unveiled, Longley’s sister in law, “Mrs Rider”, told a reporter the camera “‘…looked like a knife-cleaning machine. Le Prince bought some black cloth for a cover, and I remember him giving my sister a sovereign for making the cover…'” [The Evening Telegraph and Post (Dundee, Scotland), Tuesday, July 1st, 1930]. During their time in Leeds, Louis and Lizzie set up a school for the applied Arts, on Park Square – their work included printing images (photos?) on various items. Coincidentally, my great grandfather was later to own a printing business on Park Square. I have no idea if it was the same building. Thomas Edison’s employees started work on trying to create moving images around 1890 – two years after Louis Le Prince had shot footage in the Roundhay Gardens, and on Leeds Bridge. Before Louis disappeared, he had been well beyond his first iteration of his camera. But with Louis “missing” and yet not able to be certified dead by his family for seven years, Edison forged ahead and claimed to be the inventor of cinematography. Which was, in fact, the invention of a Frenchman, and largely carried out in a workshop in Leeds. Reading a little about Le Prince, after I stumbled on the haunting Roundhay Gardens Scene, I saw a rather familiar address. It belonged to the elderly couple in the film; Joseph and Sarah Whitley. Joseph was born in Wakefield and came to Leeds in 1844, to set up business as a brass founder. Like many of Leeds’ early industrialists, he lived for some time in Holbeck. An obituary described him as “‘the best brass founder in the world'” [Iron and Steel Obituaries, 1891]. No small claim. On the 1851 Census, Joseph Whitley and family can be found at 1, Water Lane, Holbeck, in Croft Buildings, living with their two young children and a servant. Sarah, future artist and teacher, was then aged 5 – a few doors down, my great grandmother x 2, Mary Hannah Hepton, was two, and she had a number of siblings including an older sister, another Sarah, a year younger than Sarah Whitley. It’s unlikely the children, at least, didn’t know eachother. Mary Hannah Hepton was to marry twice and her second husband was the nephew of a well known industrialist; the man who made his fortune from developing umbrella spokes and crinolines! Water Lane, Holbeck, seems to have been full of metalworkers. A few doors down from the Whitleys, my great grandfather x 3, George Pool Hepton, lived then at 8 Water Lane. George was born in 1814 so a direct contemporary of Joseph Whitley, the older man in the film. In 1861, my great great great grandad was at 55 Water Lane on the junction with Saw Mill St, where my other great great great grandfather, William Stephenson, journeyman carpenter, from Westmorland, lived. The Whitleys were in Hunslet. By 1871, they were at Roundhay Cottage and in the same year, my Heptons were elsewhere on Water Lane, somewhere near Butcher St and finally, in 1881… at 1, Croft Buildings, Water Lane where George Pool Hepton was a Rent & Estate Agent along with his partner, and son in law, Joshua Strother. Thirty years on, and when the Roundhay Garden footage was shot, my family were still living in the very house where Joseph and Sarah Whitley, Louis Le Prince’s in-laws, had once lived and where Sarah Elizabeth Le Prince’s wife spent part of her childhood, until the Whitleys moved to Roundhay. At the time the Whitley’s lived in Croft Buildings, my family were just three doors down. Two of the people in the Roundhay Gardens film, were neighbours of my great grandparents x 3 and as contemporaries with children the same age – they must have known eachother. After discovering this, I have found the footage even more haunting and cryptic. I don’t have a single photo of George Pool Hepton, or Hannah and they will always be unknowable to me. But there, dancing on a lawn, one long lost autumn in Leeds – their direct contemporaries and former neighbours – people who would have recognised them in the street. Somehow, you can imagine Joseph doffing his hat. Images taken from Wiki Commons. In public domain.